Currently listening to last week’s episode of The Poker Beat. Hadn’t yet heard the second half of the show. Always love the parts I’m not on, because it’s where I actually learn something. Not so excited about hearing me and BJ talk about the WSOP Conference Call (no offense, BJ) … but definitely want to hear Gary and Jess break down what happened early last week at the confluence of FTOPS and SCOOP. Supposedly there are some disputes over whether or not 20+ hour tournaments are unfair to players or just begging for Terms of Service violations and other shenanigans. And of course can’t wait to get to Stapleton’s Tight Laydown … to hear what he decided to go with for the Annette15 joke! Dinner break in plo, avg 32k, got 20k. Lost half my stack with KxJxTs9s on KJs8sAx5x board lol. 30 something left, 16 paid. Start in 1h. Final table :). 9 left. Cont. tomorrow at 4. Avg 100k. I got 150k. 40k for first. 1x? A nice little roadmap on how to move from the middle of the pack to the final table with the momentum it takes to go all the way, no? 40k AUD ($36.7 USk). REMINDER: Today is Omaha day at the Hard Rock in Las Vegas. Playing 1/2, half no-limit hold’em, half PLO … w Run-it-2x. I like to think of this game as PLO with training wheels. Did you know sets aren’t necessarily all that good in Omaha? John Paul Kelly 2009: 2 bracelets, 2 continents. 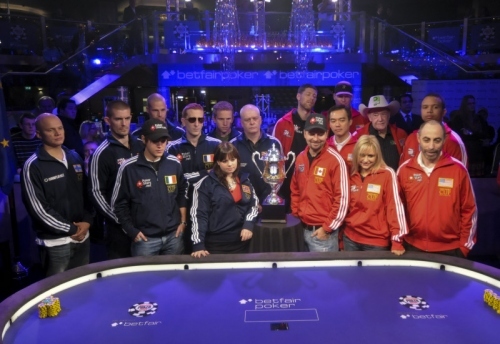 The first event of the 2009 World Series of Poker Europe is completed and we have crowned the first champion. He ended Day 1 as the chipleader and finished the tournament in the same vein, step forward MrÂ JP Kelly. The Â£1,000 entry-fee appealed to pros and amateurs alike, with Day 1a attracting 295 runners including the likes ofÂ Phil Hellmuth,Â Roland de Wolfe andÂ Dave ‘Devilfish’ Ulliot with the former being eliminated very early on into proceedings. After raising preflop, then calling a re-raise fromÂ Eddie Hearn, Hellmuth somehow managed to get all his chips in the middle holding 5h6h which gave him an open-ended straight draw. He definitely needed to hit as Hearn held pocket kings, but a 9s turn followed by a Qc river saw ‘The Poker Brat’ heading for the rail. The action was thick and fast due to the shallow starting stacks and hour long blinds and by the end of play only 41 players still had chips remaining! Day 1b showed no signs of slowing down either, despite it been a more pro-heavy day withÂ Phil Ivey,Â Chris ‘Jesus’ Ferguson,Â Annette Obrestad and 2008 WSOPE Main Event winnerÂ John Juanda taking to the tables. Out of the 313 that started, only 58 would return for Day 2. JP Kelly was the overnight chipleader with 99,000 chips butÂ Richard Kellet,Â Ian Frazer andFabian Dunlop were all hot on his heels with stacks around the 65,000 mark. Of the 89 remaining players, only 63 would make the money, meaning 26 unlucky players would be going home empty handed. We know her, of course, as something between the Tracy Austin of Poker and Johnny Moss of WSOP-E. 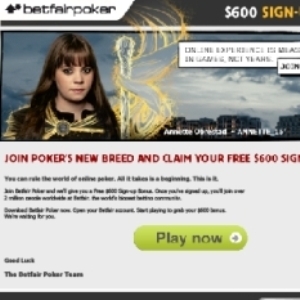 But that makes no difference … even in the UK, poker is still poker, and thus Britain’s Advertising Standards Authority has banned an ad for Betfair featuring Annette Obrestad, after a complaint about her celebrated screen name, Annette_15. The ad for Betfair showed a photo of a young woman with the tagline “Online experience is measured in games, not years. Join the new breed. Annette_15”. The Advertising Standards Authority (ASA) has upheld a complaint made about the advert, saying it “was likely to have particular appeal to children and young people, and that, by representing a successful young poker player with the implication she was 15 years old, it could encourage young people to gamble and was therefore irresponsible”. NOTE TO SELF: Scrap plans for British Under-12 and Under-14 Poker Championships.